Last month on May 25th, it was announced that the Australia sim would be closing. The decision was made by its owner, Whelan Ferraris. When I dropped by the sim that day, he was there and greeted me with a polite, "G'day." Asking him about the sim closing, he explained money was part of the reason, having spent 12,000 Australian dollars. He handed me a copy of the statement he made for the sim's group. Well folks, I hope you have enjoyed the little that we've been able to offer at Dingo Bay, it has been a pleasure to put it all together and make a little slice of 'Australian' fun available for friends to meet and relax. You may or may not be aware that another six Australian or Aus-related sims have ceased in the last month. Sadly, we must follow that path. 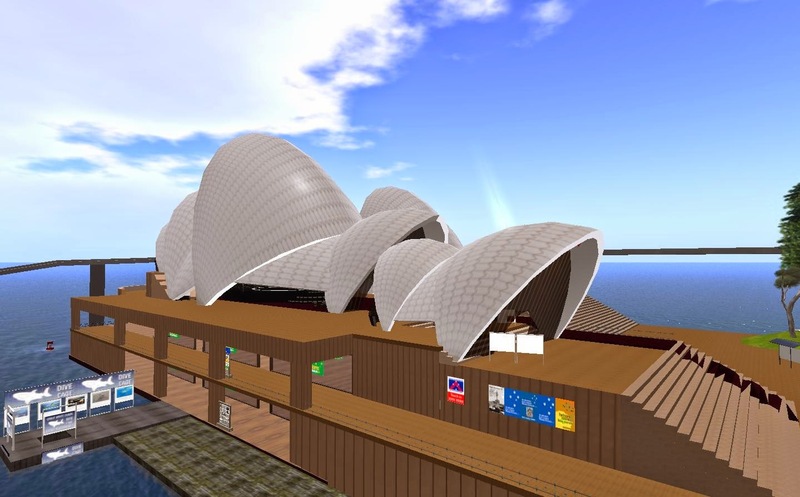 Gem and I have enjoyed seven years in SL and the last couple of years have been part of a dream to keep Australian presence in SecondLife. We have viewed this sim set as an iconic representation of real life Australia and have continued to extend an ambassadorial face to the rest of the world. Unfortunately the private purse is now empty and our desire to have these sims at least meet us halfway has not come through. After tonight, Australia and Dingo Bay will dissolve. Gem, Whelan and Raven extend our wishes of continued health and good humour to yourselves, friends and family. He explained to me he was presently busy explaining the bad news to people, and would be available later for an interview. So later on, we met again. This time, the once filled sim was now close to empty, with Whelan sitting on a chair on a beach. "Still taking down things?" I asked him. "All done," he answered, "its pretty desolate with exception of couple of locals putting structures up. I'll need to revoke rights soon and clear it up." He then expressed his willingness to talk more, and passed me a chair. "Did you know I also ran a newspaper?" Whelan asked me. I told him I hadn't, and he went on, saying it was an Australian-centered Second Life publication, and passed me a copy, "Was in its sixth year this year, unfortunately several of my advertisers went down too, otherwise would have a new issue right now. I'm an old hand at this, in real-life I had my own urban/rural weekly for 17 years on the fringe of Melbourne in Victoria." "Sounds like you have quite a bit of experience with print media," I told him, "what did these two papers generally cover?" "Fairly typical of most suburban or small community weeklies, faces and places, local government activity, local sporting etc etc. I am a printer by trade with extensive experience in advanced print technology (although that aspect has changed so much) and several years in management of all areas of print and publishing. I sold out back about 1999 then went back to the trade operating and supervising a small factory near where I live. (I) Retired about 18 months ago." "How did you find out about Second Life?" I asked. Whelan answered, "My internet service provider was BigPond, a trading name of Australia's major telcom, Telstra. They were advertising low cost entry into this SecondLife realm and that caught my interest. Like many other Australians at the time we took the bait and arrived by the truckload! (laughing out loud)"
"Heh heh, how did your first days go?" I asked. Whelan Ferraris told me, "I was like a kid in a candy shop. Like everybody else, had to try everything. Of course most of us reverted to our teen years and performed as though we were bullet proof. Its been a fascinating trip, so much one can learn and if keen enough can keep on learning in Second Life. Of course, like everyone else, went through a period of maturing. We wre pretty brash and got away with so many things one would not consider in real life. But I guess the same applies now too, Most of we older SLers frown on the antics of the newbies." "When did you first hear about this sim?" I asked. Whelan answered, "It came to my notice just a couple of months before 'The Pond' went down. The Pond was the simset established by Telstra's BigPond I mentioned before and was the gateway through which many of us early arrivals entered. I arrived March 2007, The Pond was abandoned by BigPond in November 2009. So I came to Australia and built a large house on one of the three sims that comprised the set, Top End." Whelan nodded, "I shifted around a bit after that, had probably four or five other locations before returning to Australia for good. I leased the Top Dingo sim and shifted it from the Eastern to West side of Australia and renamed it Dingo Bay. Was about 12 months later I bought Australia from Pants and Mahala. So its about 3 years now since I came back here permanently." "Where they having trouble keeping it up?" I asked. Whelan Ferraris answered, "Pants and Mahala were very attached to their 'baby' so to speak, but their creative talents won them a lot of sim development work, particularly for tertiary educators. This took them away from the sims quite a lot but it was a need they had to fulfill after all, this was earning more reward than the sims." "Were there many changes here after you began running the sims?" I asked him. "Considerable change," Whelan answered, "I went about systematically replacing many of the old 10m x 10m prims and reducing prim count thus enabling me to become very familiar with the layout and everwatchfull for ways to 'value add'. in the long run I had doubled the commercial floor space and added more small features as one would expect a developing city to go. The Opera House became more effective as a potential entertainment centre. In the Northern end I developed a large auditorium capable of seating 200 avs." "What was it's biggest event?" I asked. "It never really got to do anything," Whelan explained, "we had appointed Sammy (Fairlady) Diaggio as our Entertainment Manager and she had her plans for bringing us up to disco style entertainment six days a week and a monthly live event in the town square or up on the Uluru platform. The largest events brought in consistent 40 to 60 avs through the duration of performance. We just fell victim to diminishing crowds and also ran out of time and money. Didn't get a chance to use all the development." "What were some of the more memorable events here?" I asked him. "Australia Day was good," Whelan answered, "couple of charity events, always when live entertainment was in the offing, we could attract fair crowds. We were getting used to all the small detail one had to attend to, we still had a little to learn but we could see the possibilities. Better operators than us have gone down so not too ashamed of our efforts." I then asked, "What was the most hilarious thing that happened here, either deliberate or accidental?" Whelan chuckled, "Crikey! There are many! One never tires of the spontaneous mirth emitting from many of the regulars. Some have been critical of the ribaldry to be found in much of the Aussie humour but thats all part of the atmosphere. One can get a bit too tight over people being coarse in conversation but really, what does it matter when it brings a good belly chuckle?" "I get a bit cranky when some of the guys are making over the top sexual remarks or derogatory comments to the girls, there's no need for that! We are all made equal and when a guy believes his appendage proves him superior, I have a tendency to reach for the ban/eject button. I have banned a few, but it has been following a warning generally. However, if somebody was blatantly disgusting or abusive, there was little or no warning, I believe there is give and take but if you cannot act decently among others you are anti-social, thats psychotic behaviour in my book for we are social animals in the highest order." My next question, "About the sim closing, was there anyone coming forward to keep them going?" Whelan had this answer, "I didn't give too much warning, I think I had proven beyond doubt the current climate is impractical to run sims of that nature on a small loss or break-even basis. I also didn't want Aussies who had already gone through a doubtful period before I took over to be placed in that situation again whilst I was paying for it. I could not afford the time. It was a strictly commercial decision and such decisions are acted without fear or favour." "Mind you though, I'm bleeding over it now after making so many good friends and putting so much work into the sims, I really enjoyed it." "Yes," I told him, "I've seen people talking about the sim, pictures on Facebook, there was even a video of the sim that was done as a tribute." Whelan rsponded, "Yes, a nice bit of footage by a well known Aussie Mudslinger Ning, that guy had his heart in Australia too!" "So you feel the sim will live on in peoples' memories for years to come?" I asked. 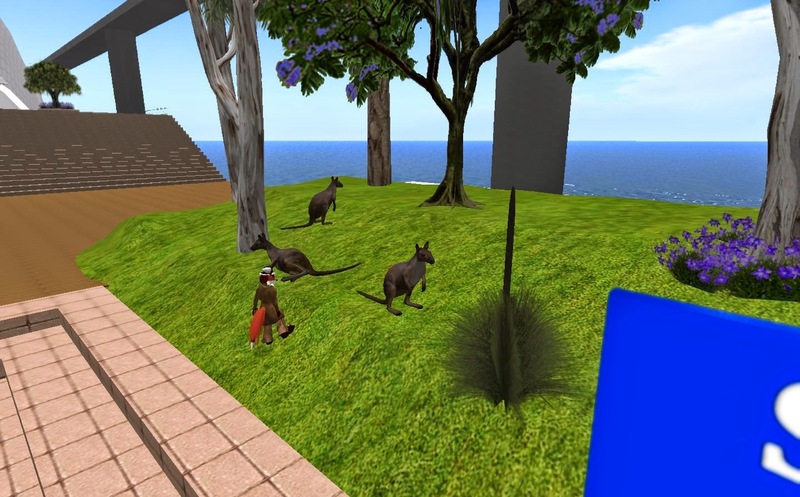 Whelan answered, "Yes, particularly among the Australians, like me, many of us regarded the sim set as the closest iconic representation of our homeland and we felt our role as ambassadors for RL Australia. We are a diverse nation like the USA, built on the talents and aspirations of people from many other origins but united under one flag." "So now what are your plans for the future?" I asked him. "At this point, my real life needs some concentration," he told me, "I have exhausted considerable real life savings on the SL venture so I must realign. I have also real life commitments this coming year as my membership of Rotary organisation has me taking Presidency of my local club and there are considerable challenges ahead." 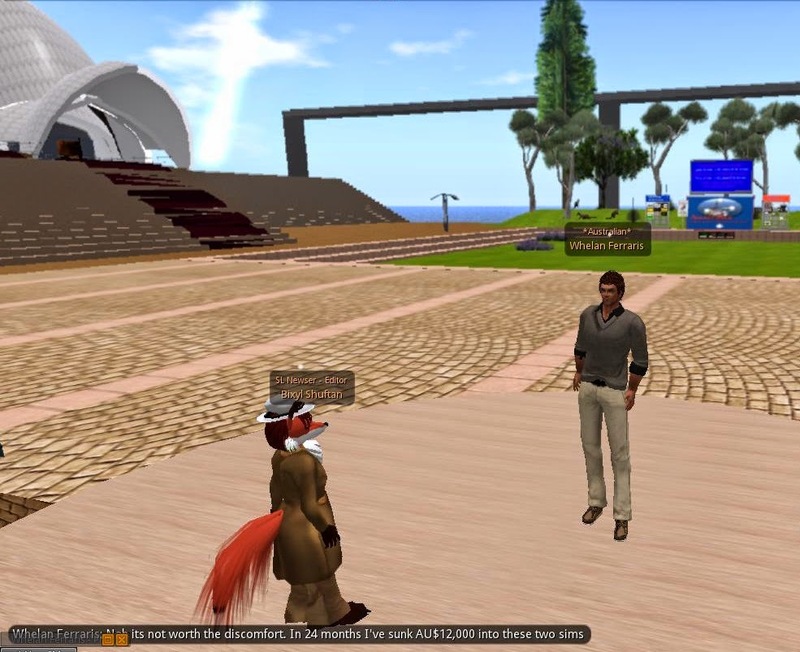 "I can't see me coming back to re-establish Australia again in Second Life. However, I may consider doing the same again on another grid but that is a dream that may not be fulfilled, few of us can predict the future. 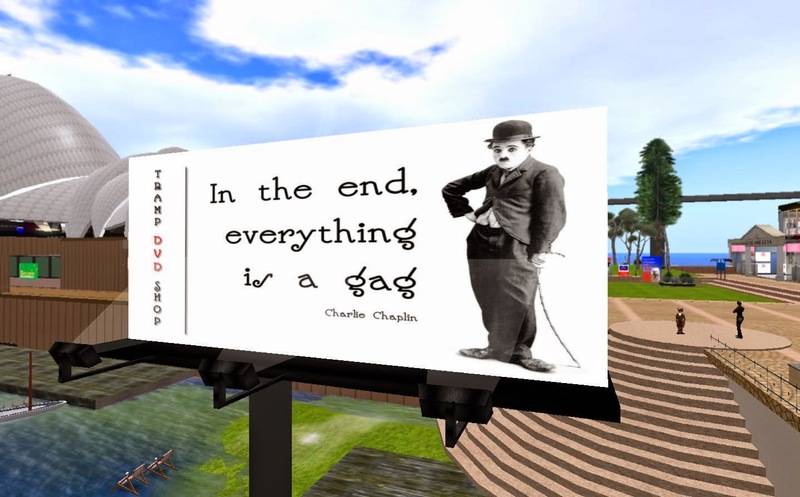 SecondLife still holds so much of me. I will keep a presence but to what extent is yet to be seen." I nodded, "Was there anything else that you thought should be mentioned?" Whelan spoke once more, "I would extend my thanks to all who's path I have crossed or who have crossed mine, this has been a unique experience that has not flagged since I arrived in 2007. As everyone knows, inhibitions are lifted, restraints are cast aside and the real personality is freed. It takes some time to get used to that but those who do go on to enjoy the company of some very precious souls. My thanks and good wishes to all of you." It was about this time we bade each other goodbye, and we went our separate ways.